The McLaren 720S has a teardrop-shaped cabin with a glass roof and glazed C-pillars to the rear. McLaren Automotive shifts to a bold new design language with its new 720S after being criticized for playing it too safe on looks. The futuristic-looking 720S has a teardrop-shaped cabin with a glass roof and glazed C-pillars to the rear that that gives "unrivaled" vision for the driver and passenger, McLaren said. The new supercar marks the first time McLaren has replaced one of its models since the company launched its first car six years ago. The 720S replaces the mid-range 650S, which started life as the MP4 12C in 2011. The 720S is a "revolutionary leap forward" for both the company and the supercar segment, McLaren CEO Mike Flewitt said in a statement. "It has a breadth and depth of abilities that involve and satisfy a driver in a way that no competitor can," he said. First deliveries of the car start in May. The 720S's side intakes, which are needed to cool mid-engine sports cars, have been hidden within the double-skinned doors to create a smooth surface toward the rear of the car. McLaren describes the aluminum body as being "shrink-wrapped" around the carbon fiber 'tub' chassis. The new chassis is lighter and brings the dry weight of the car down by 18kg to 1283kg compared to the 650S coupe. The 720S is powered by a 710hp version of McLaren's twin-turbocharged V-8 engine enlarged to 4 liters. The car's top speed is 340 kph (212 mph) and the car accelerates from 0 to 100 kph (62 mph) in 2.9 seconds, the company said. McLaren said the car's cabin sets new standards for usability and comfort within the supercar segment. The upward opening 'dihedral' doors require 155mm less space either side to open fully, which helps in tight parking lots. The 720S has more trunk space than the 650S at 210 liters and the passenger compartment has an "extraordinary perception of space," the company said. 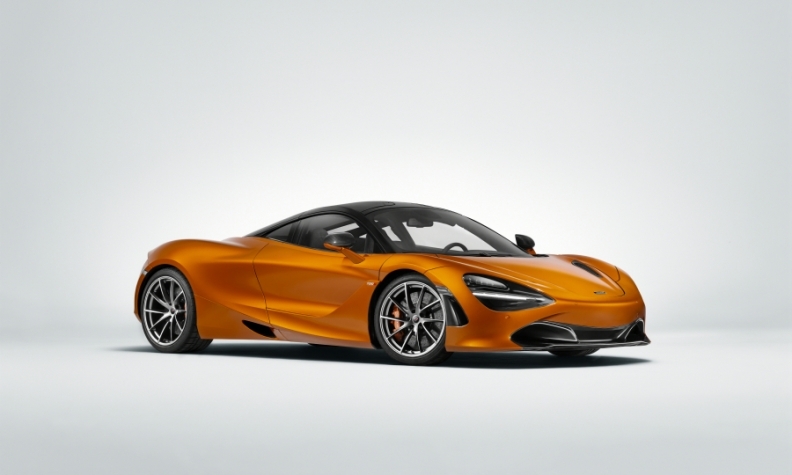 The 720S is designed in part to be used on the racetrack, and to reduce driver distractions the digital-instrument binnacle can fold down to leave just a rev counter. The 8-inch touchscreen in the dashboard can be configured to display track statistics such as g-forces and lap times. It also displays a panel in which drivers can adjust the amount of rear-tire slip, or drift angle, using a finger-tip slider on the screen. The car is designed to be easy to use on the track, McLaren said. "Drivers of all abilities can head to a racetrack in a 720S and experience truly exceptional grip, balance and control," McLaren's chief test driver, Chris Goodwin, said in a statement. Helping high-speed control is an active rear spoiler that McLaren generates 30 percent more downforce than the wing on the 650S. The wing can be flattened to reduce drag or fully deployed to act as an air brake under full braking.